Today, the morning started out with promise with a clear and sunny sky. However, soon the sky clouded over, and it was cold and gray the rest of the day. We walked to the Red Gate in Spitz in the morning. 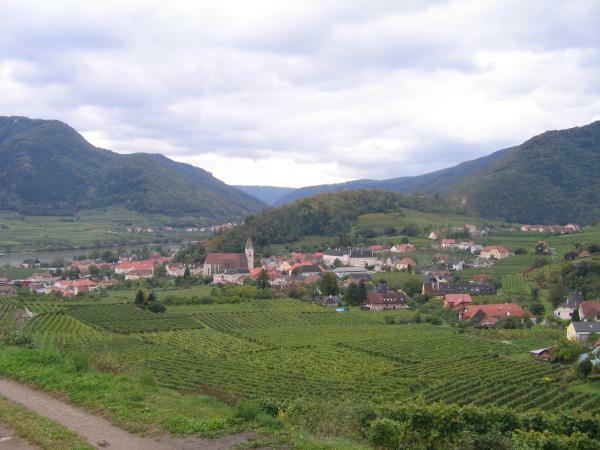 We entered the Wachau wine-growing valley yesterday, so Spitz was in the middle of the vineyards. We had a great view of the vineyards, Spitz, and the river from the Red Gate. We also got groceries in the morning in Spitz. As we were walking to the grocery store, a maniac driver leaving the gas station drove straight towards us before turning away at the last minute. He had a smile on his face the whole time, so he thought it was funny. I did not like Austrian drivers at all, and in my opinion, they were as bad as the Belgian drivers. Sometimes, the bike route went along roads that were supposed to be low traffic, but there were actually quite a few cars. The cars did not slow down or move over for bike riders. On one stretch of road, we moved over the side of the road every time a car went by because we were afraid of getting run over. Fortunately, the ride today was along bike paths and quiet roads, so we didn’t have to deal with cars so much. 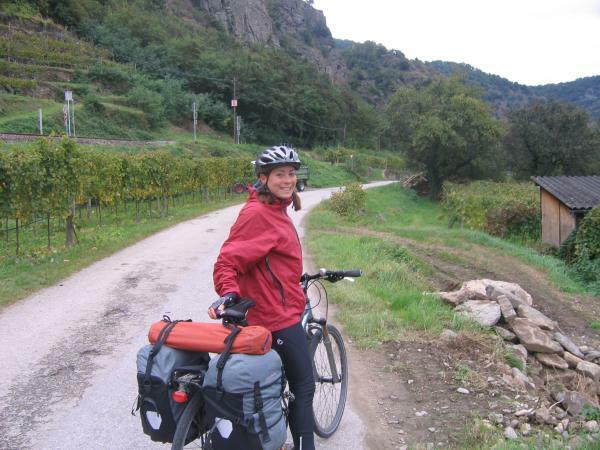 It was really pretty riding to the Wachau valley vineyards. We pulled over and tried a few of the grapes, and they were really tasty. It was also neat to see the people picking the grapes in the vineyards. 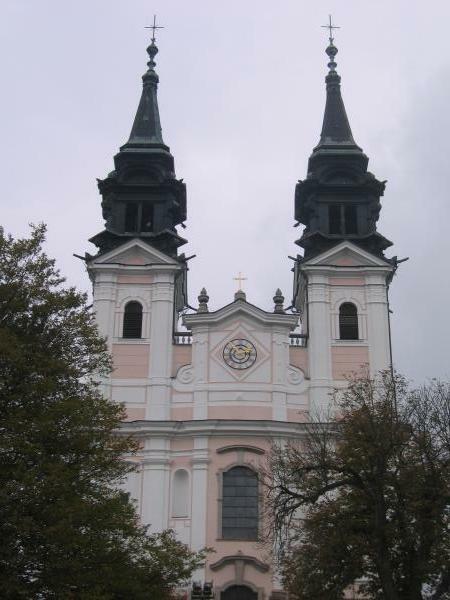 We left the Wachau valley when we reached the city of Krems. When we checked the Internet in Krems, both PrintWhatYouLike and GrinnellGallery were down, so we had to spend time getting them running again. PrintWhatYouLike ran out of space on the server, and MySQL crashed on GrinnellGallery. Fortunately, we were able to get both sites up again. However, we were forced to do this at the most expensive Internet place. It was 10 cents per minute to use the Internet on a old computer still running IE6. It cost us 6 euros for an hour of Internet, but it was important to get everything up and running again. It was late by the time we left Krems, so we had to crank out the miles. We stopped in Zwentendorf, and we stayed at another nice pension. We were surprised to see the sun trying to peak through the clouds this morning. We were optimistic that today might be a better day for the weather. We enjoyed the ride along the river in the nice, dry weather. However, when we took a short break outside Melk, it started raining on us. Just when we thought the weather was getting better, it had to rain again. Fortunately, the rain blew over relatively quickly, so we didn’t get soaking wet. 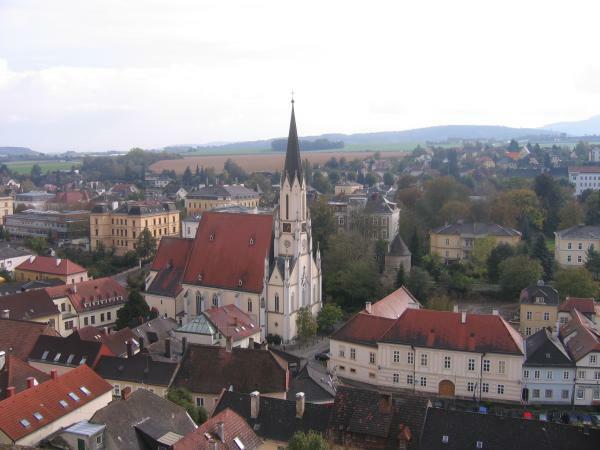 Melk was known for its beautiful Benedictine abbey. St. Benedict left Rome because he was disillusioned with the corruption of the Catholic church. However, the abbey was ornately decorated with lots of gold, and the abbey had many expensive treasures that had been donated. It seemed to be a contradiction with his reason for founding a new order of the church. 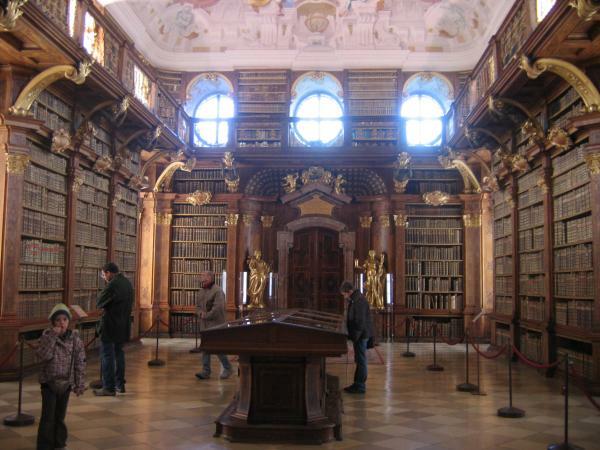 My favorite part of the abbey was the beautiful library with lots of old books, and it had also had lovely frescoes on the ceiling. 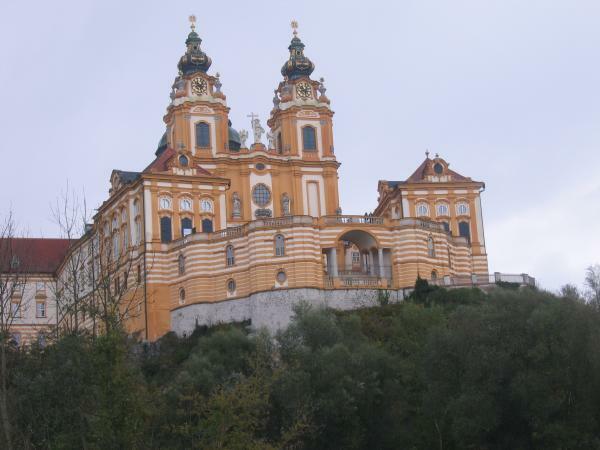 The abbey was also built on the top of a hill, so it had a great view of the Danube river and the town of Melk. 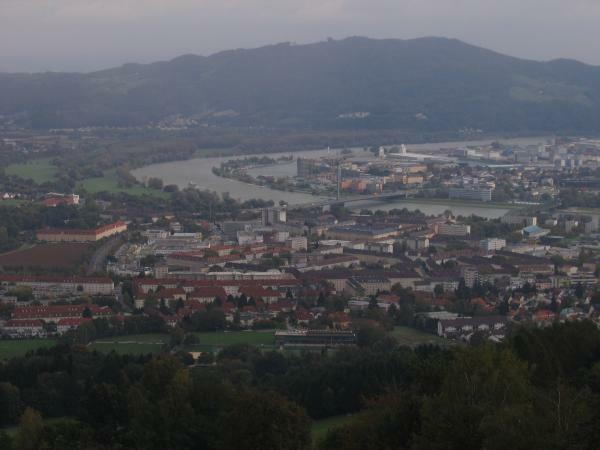 Fortunately, as we rode out of Melk, the weather cleared up, and we actually saw the sun! 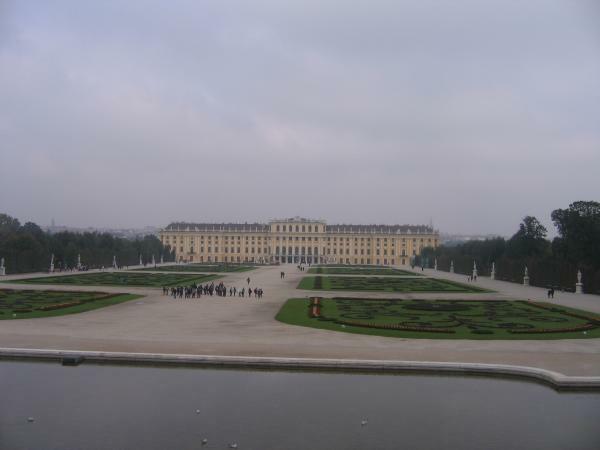 The scenery after Melk was very neat. 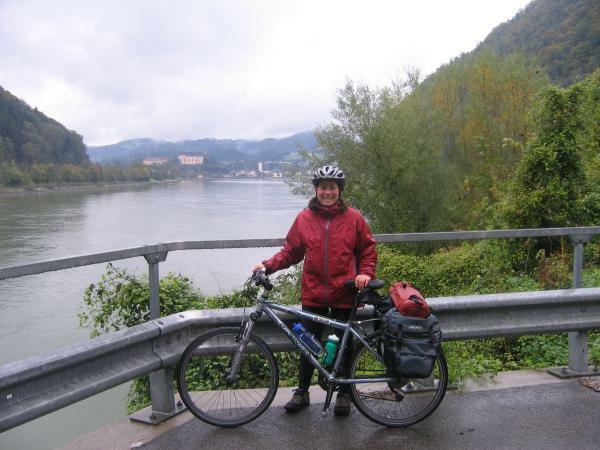 The mountains became more impressive, and they were more impressive than the mountains we saw when we rode out of Passau. It was late by the time we left Melk, so we only rode a little further. It still was too cold for camping, so we found a nice pension to stay for the night in Spitz. Today was a miserable day for riding. It was still really cold, and it rained on us the entire day. However, we saw on the news this morning that the weather was going to warm up! By Monday, it would still be colder than average, but it was supposed to be sunny! We hadn’t seen the sun in days. We hoped that we had gotten through the worst of the nasty weather, and the weather would get better after today. Despite the weather, we biked a long way today. We tried to stop in Wallsee for lunch, but everything was closed when we arrived. We arrived a few minutes before noon, and everything closed at noon. I was cold and wet, so I was looking forward to sitting down in a warm, dry place. We tried to find a sheltered place to cook some lunch, but we couldn’t find anything. We arrived in the next town, and everything was closed there, too. We finally decided to into a guesthouse restaurant, and it was really nice to sit in a dry place and eat warm food. Jonathan ordered the turkey schnitzel. I ordered the vegetable schnitzel, but when I ordered it, the waitress didn’t realize that they had such a thing on the menu and checked with the kitchen to make sure it was correct. But, she came back and said it was fine. The vegetable schnitzel was really good. It was like a breaded potato and vegetable patty. We felt much better after drying off and getting a warm meal. 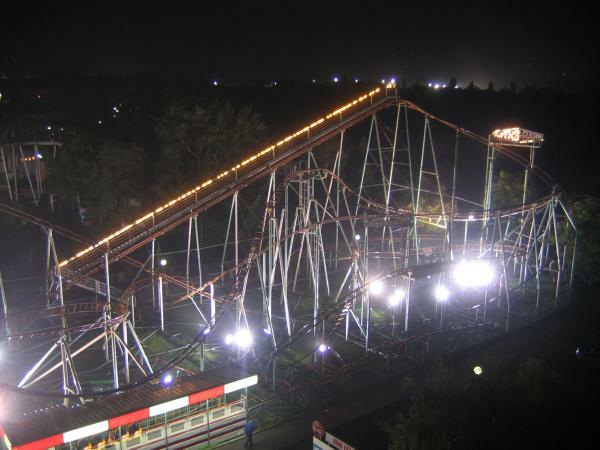 The next part of the ride was really neat. Mountains began rising up for both sides of the river. This section of the river at Struden had dangerous narrows. A large rock caused dangerous eddies to form making it very difficult to navigate. Now, there is a canal that allows the ships to avoid the sharp, dangerous bend in the river. This morning we went shopping for gloves. Both of us forgot to bring gloves, and it was definitely too cold to bike without gloves. We went to the Woolworth and picked up a cheap pair of gloves. It was really cold while we were riding today, and it was snowing as we left Linz. I was really glad I had gloves. 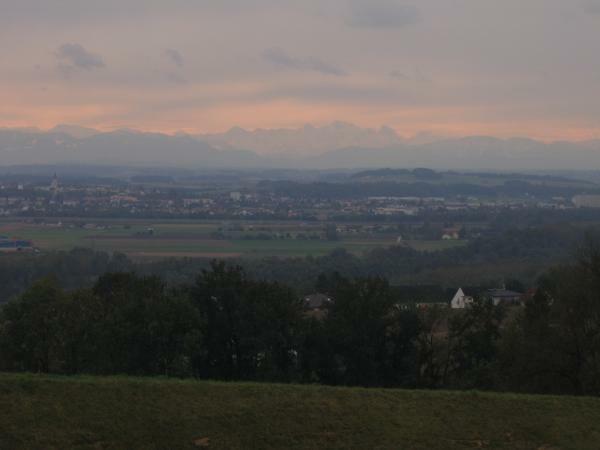 We planned to stop at the concentration camp at Mauthausen, and as we arrived at the concentration camp, we saw the Alps at last! It was exciting, but it was a strange place to see the Alps for the first time. We didn’t realize how large the concentration camp was. It was the main concentration camp for the area. We ended up spending the rest of the day walking around the concentration. 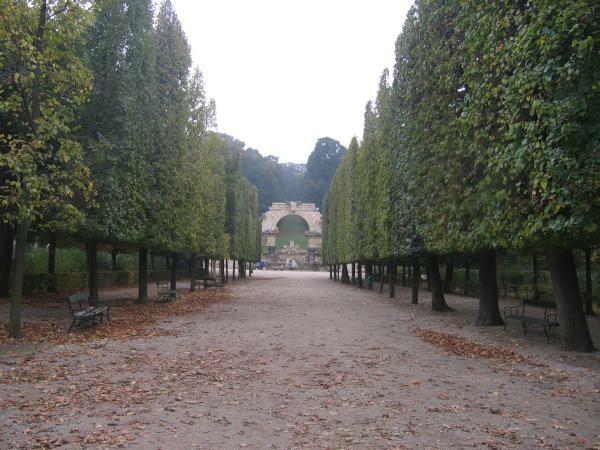 The weather was sufficiently dreary for visiting such a place. The concentration camp was interesting, but it was also depressing to visit a place where such horrific acts against humanity took place. It was especially overwhelming to go into the gas chamber where so many people were killed and look at the crematoriums that were used of disposing of the bodies. Towards the end of the war, the crematoriums were not sufficient for disposing of the bodies, so they had to dig mass grave sites. 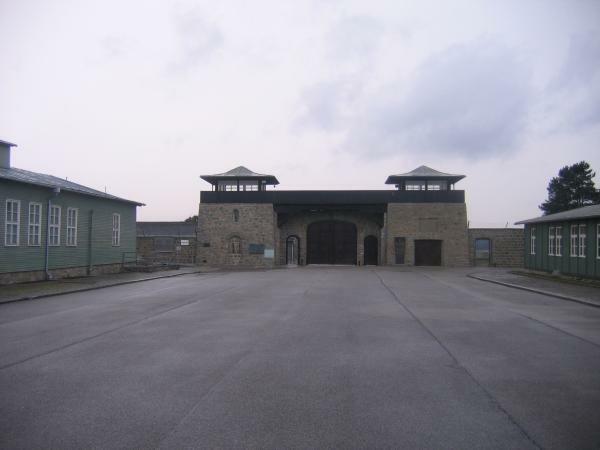 The concentration camp was foreboding with high stone walls enclosing the camp. They also had barb wire along walls that had 370 volts of electricity running through it. Many people committed suicide by electrocuting themselves on the wire. Many others tried to escape the concentration camp, but if they were caught, they were publicly executed in front of all the other prisoners. The concentration camp was a horrific place to visit, but I hope it will motivate people to prevent such a horror from happening again. We saw a racist political sign in Linz that said, “Tradition or invasion” implying that Eastern Europeans were not welcome in Austria. I was tempted to put a Hitler mustache on the man in the poster, and another person had drawn a Hitler mustache when we walked by the poster again. It was still too cold to camp, so we stayed at another nice, warm pension tonight. The family running the place had a really sweet Lab that we played with for a while. 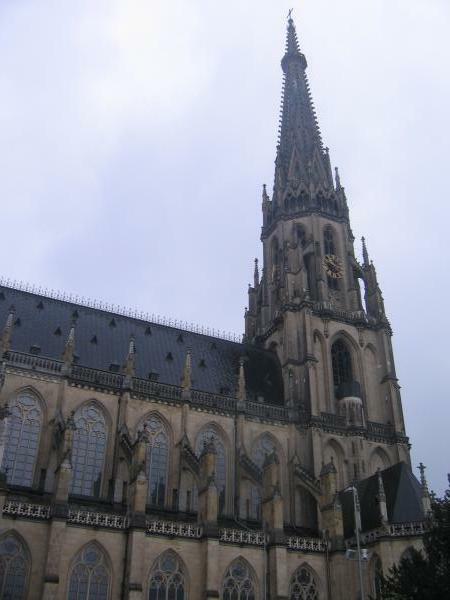 Linz has a large cathedral built in the Gothic style. 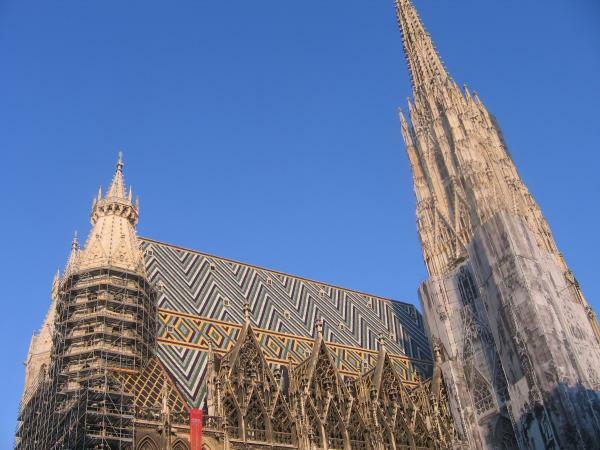 The cathedral was similar to the cathedrals in Regensburg and Ulm, but the cathedral in Linz had beautiful, intricate stained glass windows. We tried walking to the Franz Joseph Tower. 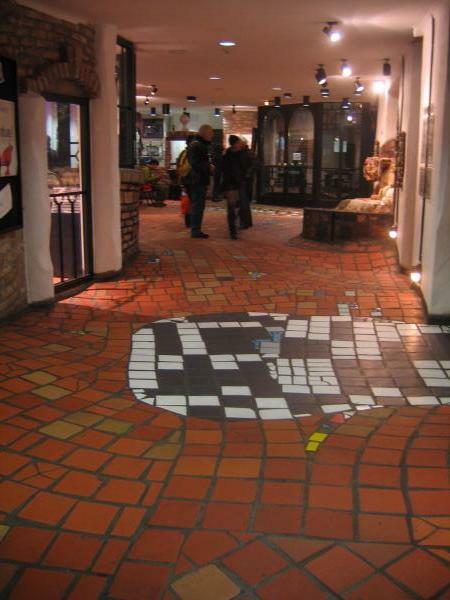 It looked so close on the map of Linz we got from the tourist office, but we kept walking and walking and didn’t see it. Eventually, we gave up and turned around. Then, we wanted to take the train to Postlingberg, which is the steepest non-rack railway in the world. We had trouble finding where the train left from, and when we found the station, we couldn’t find where to get a ticket. You couldn’t buy a ticket on the train, and there was no ticket kiosk at the train station. We were about to head back to the tourist information center to ask where to buy a ticket when we saw a ticket kiosk at random spot on a side street not on the actual train route. Although the steepest non-rack railway sounded very impressive, it was not as exciting as it sounded. It didn’t seem all the steep to us. The view from the pilgrimage church at Postlingberg was great. However, it was snowing when we got there, so we weren’t able to see as well. After walking around the city in the snow, we were cold, so we went to the nice and warm Ars Electronica Center, and it was the coolest museum! It was a museum made for geeks like us. They had lots of interesting gadgets and interactive exhibits. This was an interactive sculpture. As you walked into the sculpture, there were motion sensors, and parts of the sculpture would start moving towards you. It was really cool. 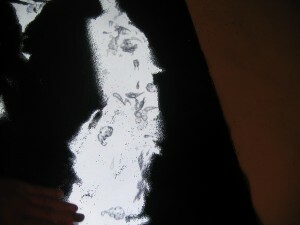 This was a screen covered with black sand that you could move around to cover parts of the screen. There were little organisms that were swimming around on the screen. If you opened up a larger area in the sand, the organisms would multiply, or if you covered the area with sand, you could kill off all the organisms. 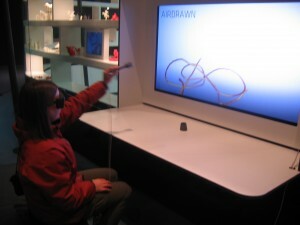 This was an interactive exhibit where you could create a 3D drawing. 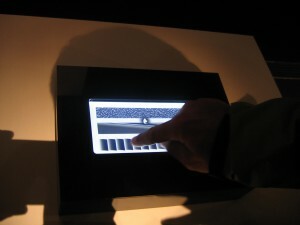 As you touch this screen, you could feel different textures on the screen, and it would make different noises as you moved your finger over different sections of the screen. There was also a little man that walked across each screen, and if you moved your finger over him, you could knock him over. Once he was done walking through the screen, the screen would change, so if you continually knocked him down, you could spend more time playing with that screen. 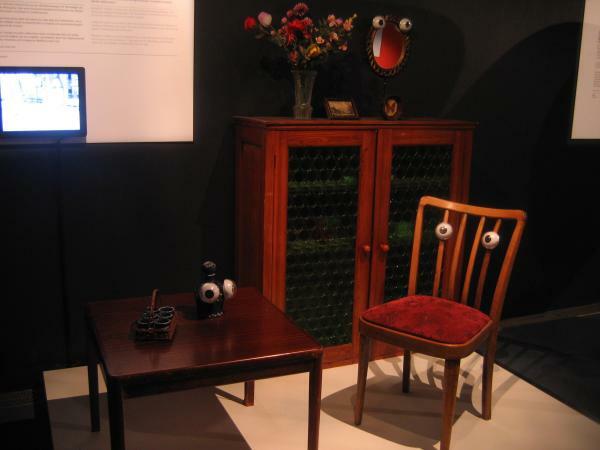 A Japanese artist put eyes on pieces of furniture, and they would communicate with each other through infrared and blink at random intervals. They had a video for a Japanese art unit called Maywa Denki that made awesome robotic musical instruments. 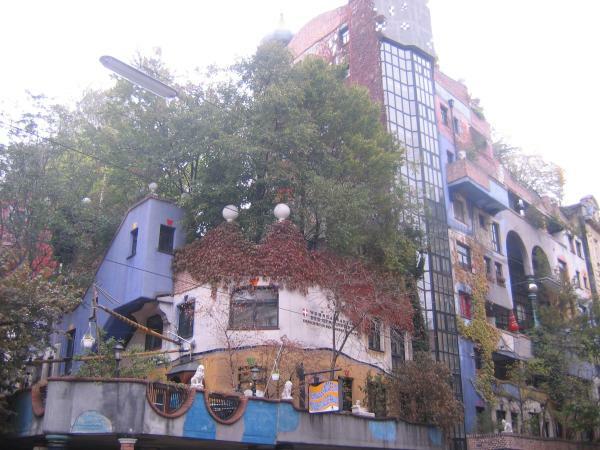 There was an exhibition called “Morpho Tower”. There was a ferrofluid, a liquid medium that has nano-sized magnetic particles suspended in that react to a magnetic field. There was a spiral in the middle of the ferrofluid with an electromagnet, and as it spun, the particles moved along the spiral seeming to defy gravity. There were several cool machines built by Arthur Ganson. Machine with 22 Scraps of Paper was my favorite. 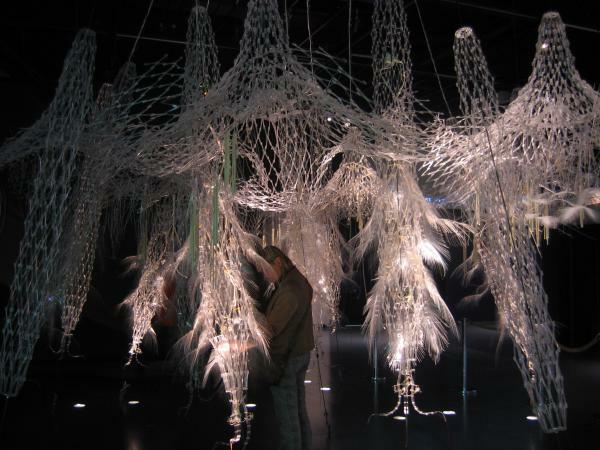 It was made only by moving scraps of paper, but it simulated the movement of a flight of birds beautifully. There was a video about the Dutch artist, Theo Jansen, who creates kinetic sculptures that are powered by the wind, and he releases the “creatures” he creates onto the beach in the Netherlands. 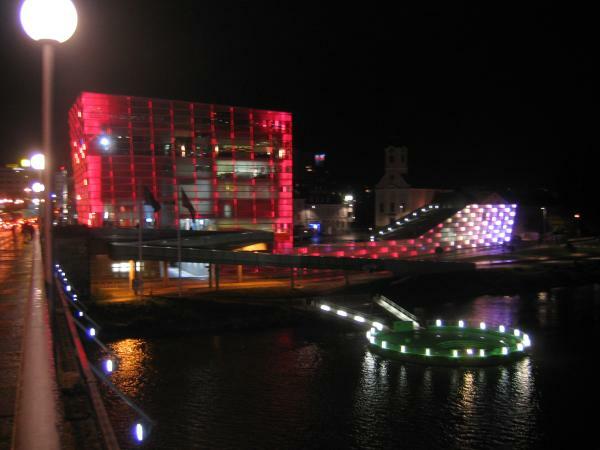 The outside of the Ars Electronica center was lit up with a series of LED lights that would change color and create neat patterns. We had complimentary breakfast at the bakery down the street, and it was really good. However, the dining area was full of smoke. Half of the people in the room were smoking up a storm. When we left the bakery, my clothes and my hair smelled like smoke, and it was really gross. I was surprised at the number of people that smoke in Europe. They even have cigarette vending machines, and a pack of cigarettes was 5 euros! That is a very expensive habit. There seemed to be even more people that smoked in Austria, and it seemed more acceptable to smoke inside restaurants. As we were packing up to get ready to go, Jonathan noticed that my back tire was a little a low on air. However, as he pumping it up, the pump broke! At the same time, the tire valve leaked a bunch of air, so my back tire was lower on air than it was before he started pumping up the tire. It was too low to ride on with all the weight on the back. We had seen a bike shop when we were walking around town yesterday, so we went over there to try to get a new pump. However, the only day of the week that the bike shop was closed was Wednesday, and of course it was Wednesday. We could never predict when places when be open in Europe. Before we got to Austria, it was usual for places to be open during the week and closed on Sundays. Now, in Aschach, the places were open on Sundays and closed on random days during the week. It was very strange. Fortunately, we found a sign for another bike shop, and it was actually open! We found a replacement bike pump, but it was very expensive. The bike pump we brought was having problems before we left, and we considered replacing it. We learned that it is better to replace your old equipment before going to Europe because it is much more expensive to replace it in Europe. But, we had a new bike pump that was much nicer than our old pump, and we were able to fill our tires with air. 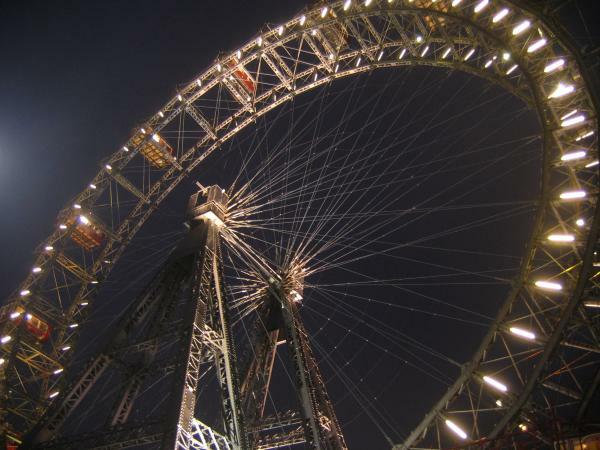 We had a short ride to Linz. It was still very cold, but it was pleasant ride along the river and through the farms. The last 10km to Linz was not very enjoyable because it was along a bike path next to a busy road going into the city. 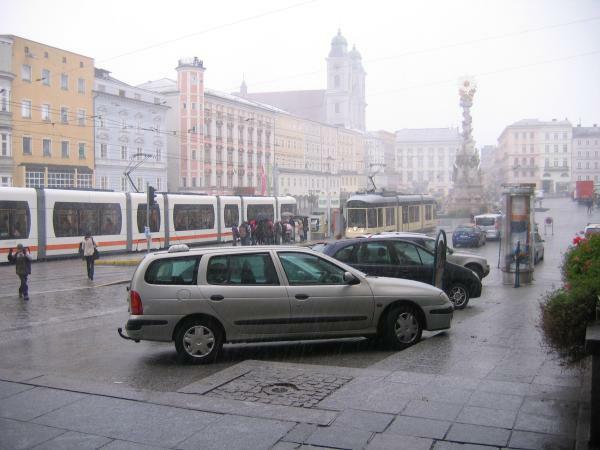 Once we arrived in Linz, it started hailing! We took shelter under a covered walkway, and it hailed for a long time. This was such crazy weather for October! We got very cold, and it was a long way to get to the hostel. Fortunately, they had a double room available for the night, and we basked in the warmth of our room before heading out into the cold again. 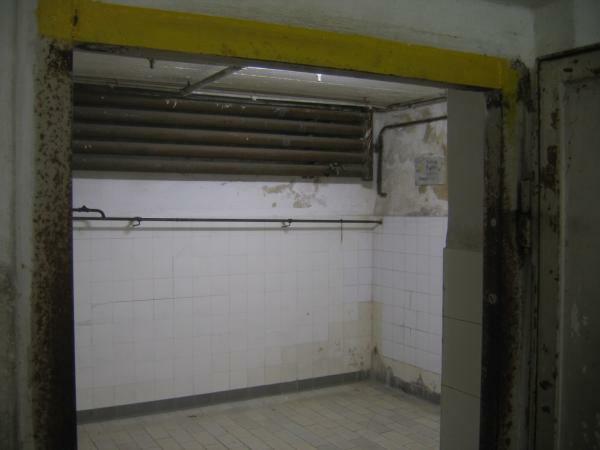 We also had our own bathroom and shower in our room for the first time at a hostel. This hostel was run by Hostelling International, so it was in a converted office building on the outskirts of the city. Once we were warmed up, we walked around Linz, and we had dinner in a nice, warm pizzeria. Originally, we were planning to continue riding tomorrow, but the weather was going to continue be cold and unpleasant for the rest of the week. So, we decided to stay in Linz for another night and spend the day in Linz. Linz had lots of museums, so we figured we could spend most of the day inside a warm museum. 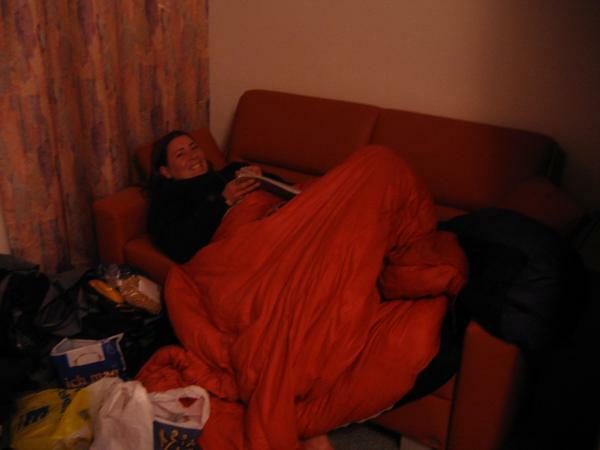 When we returned to the hostel, we asked the woman at the reception if it would be possible to stay another. However, the woman was very grouchy. She was a smoker and was coughing constantly while speaking to us. When she wasn’t coughing, we could barely understand what she was saying because her voice was so gruff from the smoking. She said to us that she speaks very little English and there were no rooms for tomorrow night. We asked about dormitory rooms, but she just yelled at us again that there were no rooms available. We gave up and decided to ask another person in the morning. When we talked to another woman in the morning, she was very nice and told it was no problem for us to stay in a dormitory room. Today, the weather was similar to yesterday. It was cloudy and cold with periods of rain, but we were nice and warm as long as we were biking. We had a nice tailwind, so we rode along at a good pace. The first part of the ride out of Passau was not very nice. We were riding along a bike path next to a busy road. Once we left the road, the bike route became much nicer. The ride was very pretty with the mountains rising up from the river. This was one of my favorite sections of the Danube bike route, and we didn’t ride by a single cornfield today. 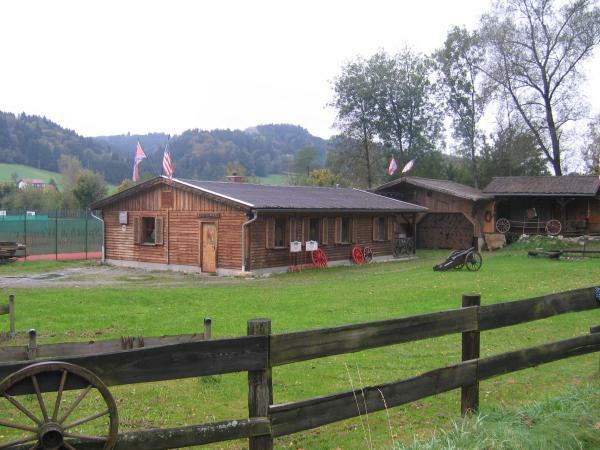 🙂 As we rode into Obernzell, we were surprised to see a house with American and Confederate flags with old cannons in the yard. It was like we were suddenly transported to the South. Today, we left Germany and entered Austria. 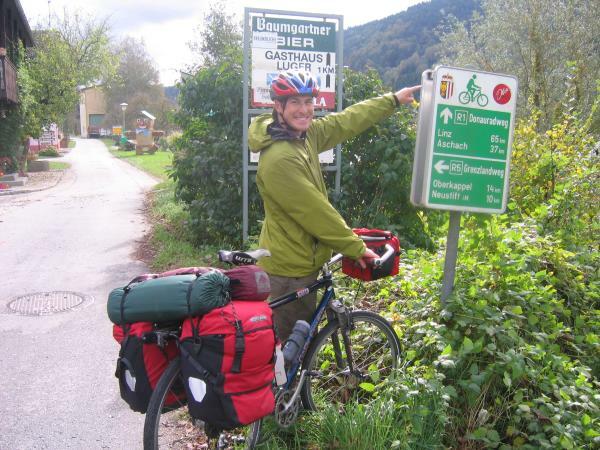 There was no sign at the border crossing, so we didn’t realize we had entered Austria until we passed a Danube bike route sign and saw that it was different from the signs in Germany. We made it to Austria! When the weather cleared up, we stopped for lunch at Au at a park next to the river. However, just as we were about to eat, dark clouds rolled in, and it began to rain. We ate quickly and started riding again since there was no shelter nearby. When we reached the ferry crossing, it was raining steadily, but fortunately, there was a covered waiting area for the ferry. It was still raining when we got off the ferry at Schlogen, so we waiting under cover until the rain passed. Fortunately, the rain passed quickly, and afterwards, it was beautiful and sunny for the rest of the day. 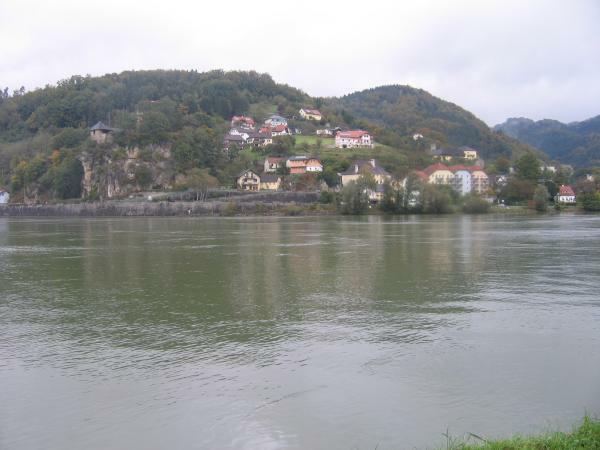 Schlogen was where the Danube does a loop around granite ridge. We hiked to the overlook, and we were fortunate that the rain had cleared because it was an amazing sight. The view was exactly like the poster on the wall of the ferry boat. 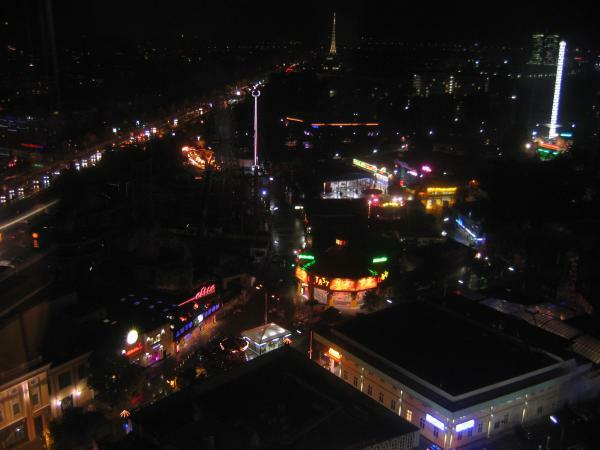 They also have a webcam at the overlook. We decided to stay at a pension once we reached Aschach because it was too cold for camping. We saw a sign for a place on the way into Aschach, and it was a penson/pizzeria. However, when we got to the pension, the sign said to go into the pizzeria to get a room, but the pizzeria was closed on Tuesdays. However, we saw a sign on the buzzer that we believed said to press one of the buttons for the pension. We tried it, and fortunately a woman answered. She let us in, and we got a room for the night. The room was incredibly nice! We had a couch, a TV, and our own bathroom. After camping and staying in hostels, this felt like the ultimate luxury. We were watching TV, and we saw the weather on CNN International. We found out that the weather we were having was not typical. 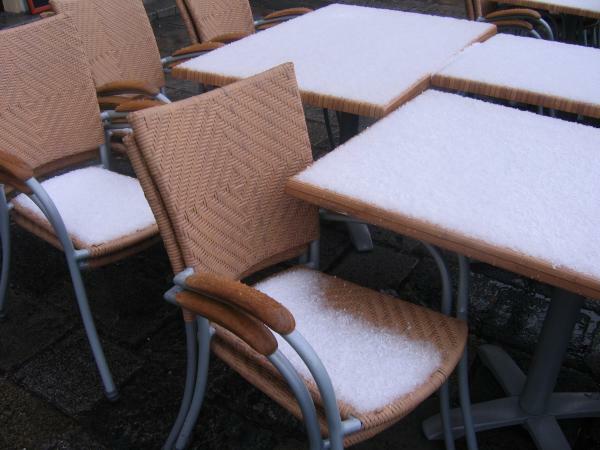 An Artic front had moved into Europe, so the entire region was experiencing early winter weather. 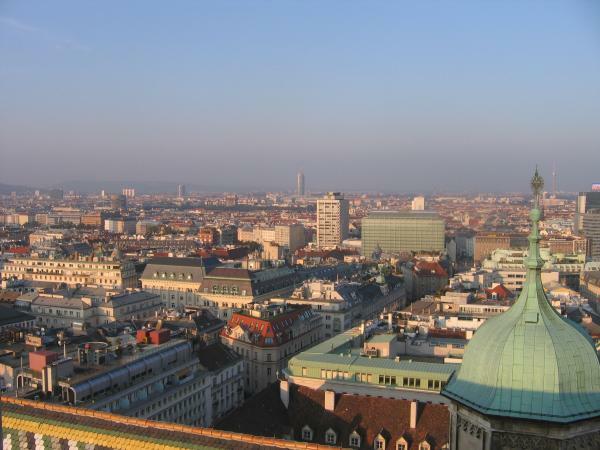 Temperatures in Germany/Austria were 9 degrees Celsius below the average. Although it was not fun to be riding the in cold, we were reassured that this was unusual weather and that it should return to normal at some point. Relaxing on the couch at our room! 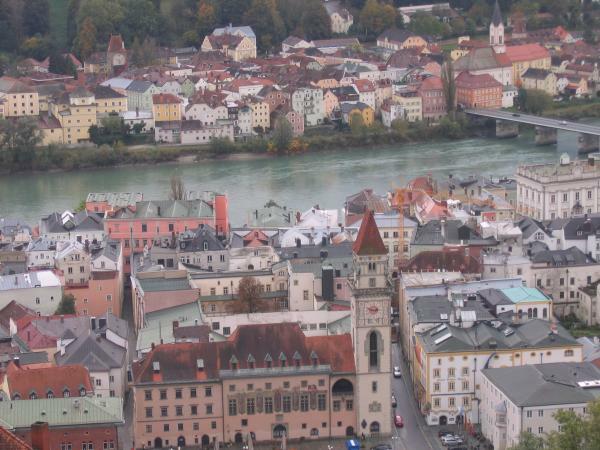 Today, we spent the day exploring Passau. We had the strangest weather today. It was sunny when we left the hostel. I was optimistic about the weather, so I decided not to wear my rain jacket. As we started walking into the city, it started to pour, and the wind picked up to blow the rain into your face. We took shelter under a covered church door. The rain shower did not last very long, but it was enough that I was completely soaked and cold. The weather was like this throughout the day. Just when you thought the rain had cleared up, it would rain again. We went to the St. Stephen cathedral for the organ concert, and we were glad to be inside a warm, dry place. 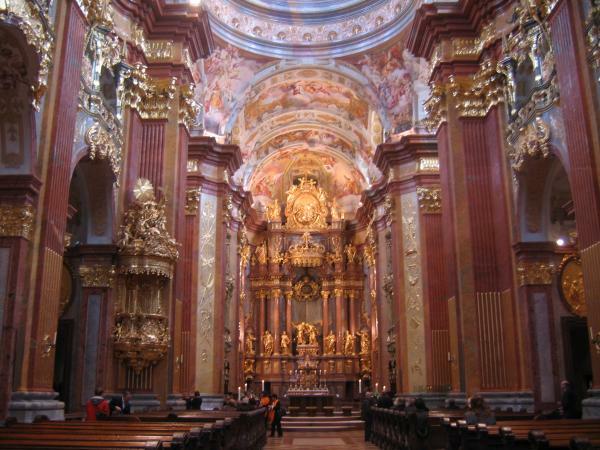 The St. Stephen cathedral has the largest church organ in the world with 17,974 pipes and 233 registers, and they have daily organ concerts. 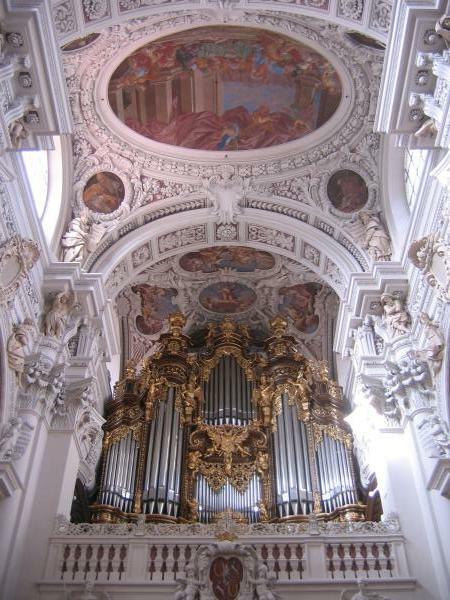 The organ is actually made up of several separate organs that are accessible from one console. The organ concert was beautiful. You could feel the vibrations from the organ. The entire church was full of people- there wasn’t an empty seat in the place. I couldn’t imagine what it would be like during peak season. The bike book said that the line extends outside the church an hour before the concert begins during the summer. There were a lot of people in the church that were on the big bus tours, and they began leaving before the concert was over. The concert was only a half hour, and they could not last that long. I thought it seemed rude that they left early, and we couldn’t hear the last song as well with all the people moving around. 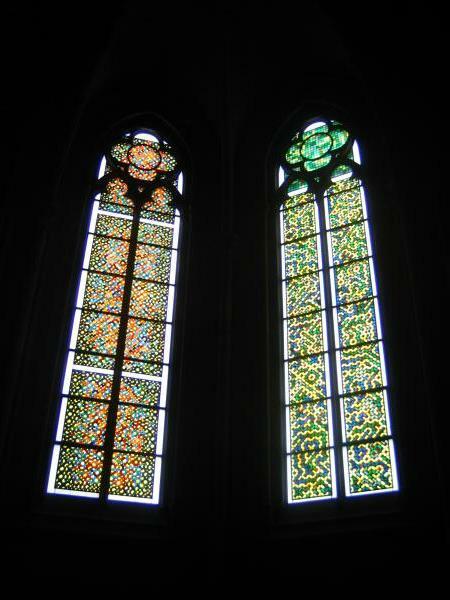 The inside of the cathedral was also beautiful. 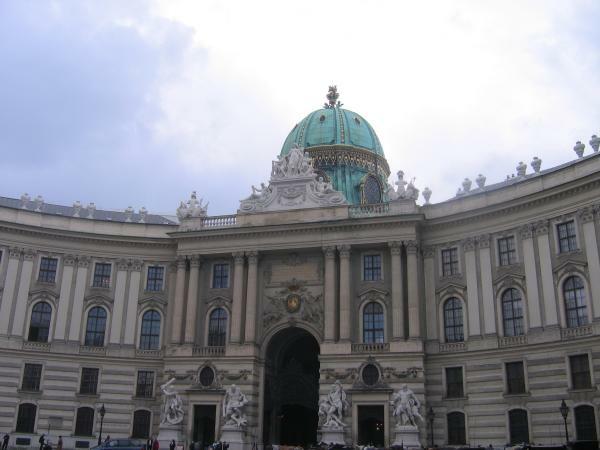 The original structure was destroyed in a fire, and it was rebuilt in baroque style. 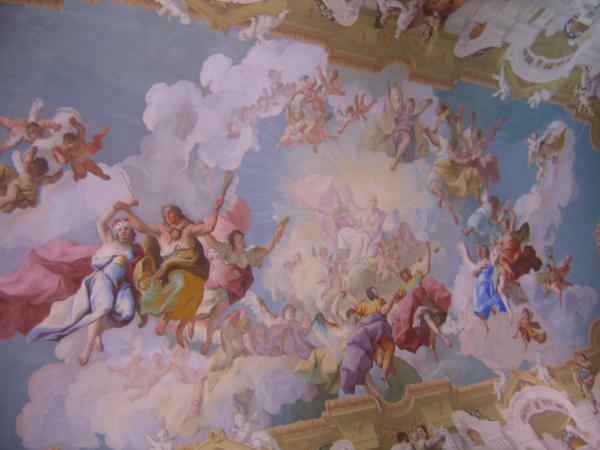 There were amazing frescoes painted on the ceiling, and the pulpit was completely covered in gold. After the concert, we were hungry for lunch. However, our timing was horrible because we were heading for lunch just as all the kids got out of school. We had to wait in a long line behind all the kids at the kebab place. 🙂 After lunch, we went back to the hostel to get warmer clothes since we were both cold and wet. It started raining again when we walked back to the hostel, but this was actually a good thing because it was cleared up by the time we had our extra layers of clothes on. 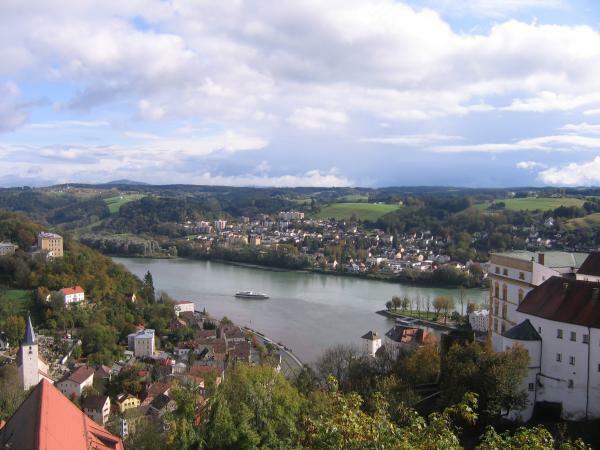 Passau was at the confluence of three rivers: the Inn, Ilz, and Danube rivers. The confluence was very neat because each river has a different color, so you could see where they meet and merge together to make a different color. 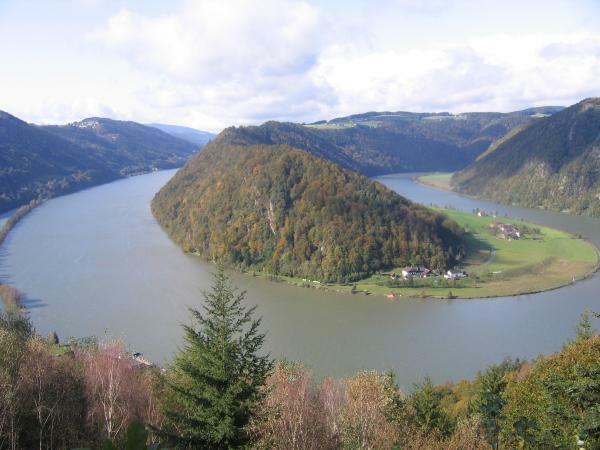 The Inn River was emerald green, and the Danube was a muddy brown. The Ilz River was much smaller than the other two rivers, but we could still see that it was different shade of brown than the Danube. At the overlook of the confluence, we also had a neat view of the city. While we were at the overlook, it began to rain again. 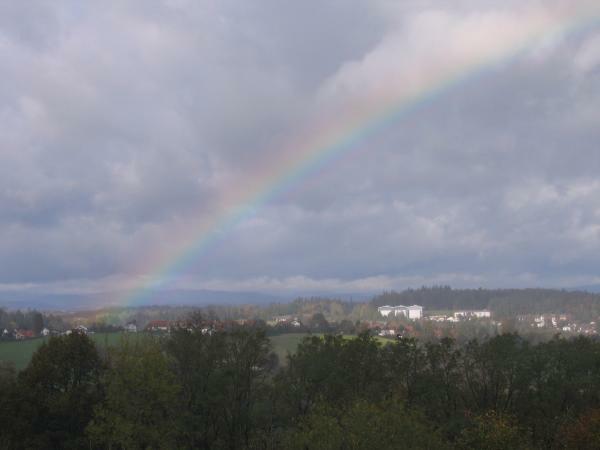 However, the rain created a beautiful, full rainbow. It was largest rainbow I had ever seen. We stopped at the strangest place to check email. The sign outside said there was Internet, but it was actually a laundromat. The woman running the laundromat had one computer that people could use to check the Internet while they were waiting for their laundry. In order to check the Internet, we went to some strange places. 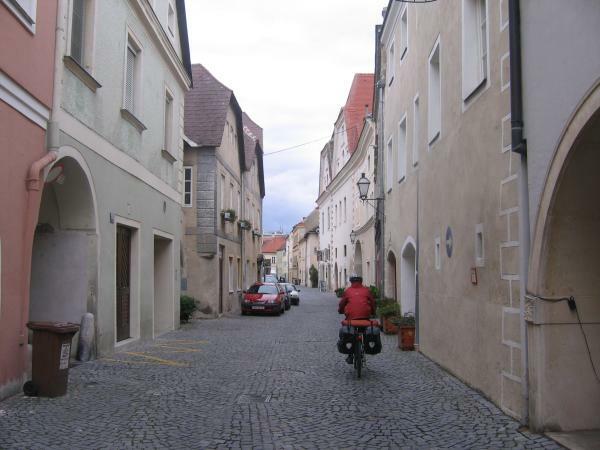 In Neuburg, we checked the Internet in the basement of a bar. The computers were mostly set up for playing poker on the Internet, and they were also coin-operated like at an arcade. I think we were one of the few people that used the computers to check email.